This LED fill-in light with mounting adapter is specially designed for GoPro Hero 7/6/5s/5/4s/4/3+/3 for SJCAM Xiaomi Yi and other brands action cameras. 3pcs LED beads, 3W power and max. 300LM brightness, 3 lighting modes(Low-High-SOS) to meet you lighting needs in different situations. Up to 30m waterproof depth allows you to make a perfect shooting underwater, with this LED light, you can use your action camera to shoot beautiful and clear photos even in the dark environment. Comes with a rechargeable 3.8V 1160mAh Li-ion battery for long time lighting, which can be charged by the included USB cable. 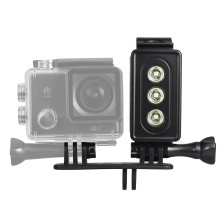 Compatible with action camera standard mounting system, can be mounted on hand grip, chest strap and head strap for more convenient usage. When the light is on, please do not look straight to the light.